If you’re after the holiday of a lifetime, this could very well be it. An action-packed week (or two, or three!) in vibrant Kerala, followed by an utterly indulgent, totally relaxing week in the Maldives. With only an hour’s flight between Trivandrum and Malé, it’s easy to combine adventure and relaxation – culture, history and buzzing markets in Kerala, and spas, snorkelling and sunbathing in the Maldives. Accommodation options abound in each location, from a houseboat on the backwaters of Kerala to luxury hotels in the Maldives. Far smaller than other Indian states, exploring Kerala feels less daunting and more accessible whilst simultaneously still immersing visitors in the culture of this fascinating country. Although you can still feel that irrepressible energy that is always bubbling just below India’s surface, Kerala has a far slower pace of life than the sub-continent’s raucous major cities. This is illustrated perfectly in Kerala’s tranquil backwaters, and a trip down them on a houseboat is an absolute must when visiting the region. Lie back on a comfy chaise longue, listen to the soothing sound of water slowly flowing past, and watch children playing in the water or waving from palm-fringed banks, men and women working in the rice paddies, fishermen paddling past in traditional dug-out canoes, and spot kingfishers, cormorants and an assortment of fish. For the more active, a stay in the bustling town of Kochi offers numerous possibilities to explore and is a great starting point for your Kerala trip. Take a look at the vast Chinese fishing nets, the only place you’ll see them outside of China, and gaze at the beautiful colonial buildings in Fort Kochi. Then head for the hills and wander round the tea plantations in Munmar – a great place to escape the heat and humidity of the lower ground. Further south, in the foothills of the Western Ghats, you can ride an elephant through tea and coffee plantations and fields of spices. Trivandrum lies on the southernmost tip of India and from there it is a very short plane ride to Malé, where you can jump on a speedboat or hop in a seaplane to take you to your island of choice. With 97 resort islands to choose from, it can be tricky to narrow them down to just one but they all have powder-white beaches, dazzlingly clear, turquoise water, and on-shore reefs teeming with brightly coloured coral and an aquarium’s worth of marine life. Snorkelling and diving are the two major activities, though just flopping down on the beach and snoozing or reading comes a close second. Most resorts also have world-class spas and top restaurants. 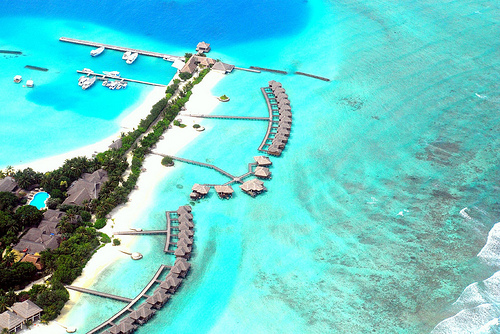 A Maldivian holiday is all about relaxation – it is a hedonistic escape from everyday life, a retreat from the world. Most countries do not operate direct flights to Malé so why not extend your twin-centre holiday to a triple-centre trip and enjoy a two or three day stopover in Singapore on your way home, the country through which many flights from the Maldives will pass? Singapore hotels are some of the most luxurious in the world and the city has much to offer the entire family. It could be a great way to end the holiday of a lifetime. This entry was posted on Thursday, November 18th, 2010 at 7:27 pm	and is filed under Kerala Suggested Itineraries. You can follow any responses to this entry through the RSS 2.0 feed. Both comments and pings are currently closed. Very informative for them who wish to visit Maldives these days.Thank you so much.. I have just go through your article and found some information which is very useful for people who love to travel here.